Petal came into the rescue in November 2014 with her 6 siblings and a half brother who was about 6 months older. They were all incredibly poorly with bad eyes (conjunctivitis) and gastroenteritis and their half-brother was diagnosed with FeLV. 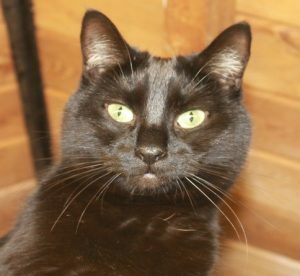 Everyone else got a new home except Parker (who died recently due to his condition) and Petal who stayed with us at the sanctuary as she was so timid that she didn’t have the confidence to go near new people so was always overlooked but she is the most beautiful black cat with a gorgeous black velvet coat and stunning oval eyes. She is extremely friendly towards everyone who knows her at the sanctuary but is still quite shy at times. You can sponsor Petal who is 3-4 years old for £25.00 a year, or more if you want to.